Altech internationally accepted enclosures stand up to the harshest environments to help you protect your devices. They protect against dust, water and corrosion while enhancing the value of your product. Rated NEMA 4X and up to IP 66, Altech enclosures are available in a wide range of sizes and a selection of materials to meet almost any application. Tooling is modular, resulting in cost effective customization. Custom colors, imprints, etc. are possible. 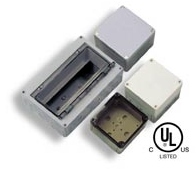 Altech enclosures can be supplied with preinstalled terminal blocks and strain reliefs. Automation 4 Less now offers a range of polycarbonate boxes for pushbuttons and other switches/pilot devices. Standard 22.5mm cutouts. Click here to go to our store for more information!